A newly discovered fungus that feasts on the skin of amphibians is threatening to decimate a species of salamander in the Netherlands, according to new research. Fire salamanders are one of the most recognizable salamander species in Europe, and are characterized by their distinct yellow- and black-patterned skin. Since 2010, fire salamanders have been mysteriously dying off in the forests of the Netherlands. Now, scientists have identified a deadly fungus, called Batrachochytrium salamandrivorans (the second part of the name translates to “salamander-eating”), that they say is jeopardizing biodiversity and bringing fire salamanders close to the brink of regional extinction. An update on the elk. They have not found what killed them. Officials with the New Mexico Department of Game and Fish are puzzling over the mysterious deaths of more than 100 elk, apparently all within a 24-hour period, in rural New Mexico. The elk were found Aug. 27 on a 75,000-acre ranch north of the city of Las Vegas. Livestock deaths, by themselves, are not unusual — there are many things that can fell large animals, including predators, poachers, a natural or man-made toxin, disease, drought, heat, starvation, and even lightning. But so far wildlife officials have seemingly ruled out most of these possibilities: The elk weren’t shot (nor taken from the area), so it was not poachers. Tests have come back negative for anthrax, a bacteria that exists naturally in the region and can kill large animals. There seems to be no evidence of any heavy pesticide use in the area that might have played a role in the die-off. Though lightning strikes are not uncommon in the Southwest and in New Mexico specifically, killing over 100 animals at one time would be an incredibly rare event. It might be an as-yet unidentified disease, though killing so many at once — and so quickly — would be very unusual. Mortality of 3 thousand saiga antelopes has been registered in Akmola and Karaganda oblasts in central Kazakhstan, Tengrinews.kz reports citing the press-service of the Ministry of Environment Protection of Kazakhstan. About 1.5 thousand carcases of betpakdalinski saiga antelopes were found at southern, western and northern shores of Tengiz Lake. This type of saiga antelopes also inhabits lowlands and steppes. All the involved national and local authorities were informed about the animals’ die-off. A whitetail deer die off is occurring again this year in Bennett County. At this point there have only been a few reports of dead deer, and all have been from the eastern part of the county. The most likely cause of the die off is epizootic hemorrhagic disease (EHD), which was the cause of the die off in 2012. At this point all of the deer reported dead in this area have been whitetails, but one mule deer was confirmed to have died of the disease in a different county. Other counties north of us are also reporting losing whitetails. Well as far as my eyes see it has a direct relationship to the poisions they are putting in the chemvtrails. Most every tree has some form of blight, people are coming down with unknown rashes and internal diseases, cancerous formation tomours on many animals and well you name it and thev have found a way to make it diseased.....well actually the ooze has... it is theSAME ooze they found at lake Vostok they are adding to the usual chemtrails and that "intelligent" substance adapts to its' environment finding any weakness and attacking. Nature however will adapt to it of course but not before killng off most of the carriers. It is a little hard to not take in the poision when your habitat is the outdoors-as Nex vhas also stated. So many fires here in OZ, I see it as not only the Earth changes and cosmic changes but I think the psycho's are adding to it where ever they can.--never let a @#$%^&* situation go to waste!. Burning the food and places of refuse the survivors can go to shelter,not just here but where ever all over the world,plus they can find us easier with tech if there is no cover of forests or bushland. No bush foods to eat, infected waters,all the animals gone or burnt, and there is not enough time left for re-generation-or very little. The waters off British Columbia, Canada, are littered with dead starfish, and researchers have no idea what’s causing the deaths. At the end of August, marine biologist and scuba enthusiast Jonathan Martin was out on his usual Saturday dive with some friends when he noticed something unusual. “We just started noticing dead starfish that looked like they had their arms chopped off,” Martin said. They were sunflower starfish (Pycnopodia helianthoides), a major marine predator in the area that feeds mostly on sea urchins and snails. Like most starfish, the sunflower starfish can regenerate lost limbs—it can have up to 20—and can grow to be up to three feet (a meter) across. Wildlife officials are trying to find out why more than 100 whitetail deer have died along the Clark Fork River west of Missoula. Fishing guides and landowners along the Clark Fork and fields near and downstream of Harpers Bridge started reporting the dead deer on Sunday. Dead deer have also been found in the Mill Creek area northeast of Frenchtown. MISSOULA - The number of dead white-tail deer in the Missoula area has grown to 350, but no cause has been confirmed yet. Montana Fish, Wildlife and Parks biologist Vicki Edwards says the lab results, which are coming from Georgia, are expected back any day now. Edwards says that in the meantime, the number of reports of dead deer continues to climb. She adds the number is actually an under-estimate because that only accounts for the deer that are visibly seen and found. "PIERRE, S.D. — A record-breaking storm that dumped 4 feet of snow in parts of western South Dakota left ranchers dealing with heavy losses, in some cases perhaps up to half their herds, as they assess how many of their cattle died during the unseasonably early blizzard. Meanwhile, utility companies were working to restore power to tens of thousands of people still without electricity Monday after the weekend storm that was part of a powerful weather system that also buried parts of Wyoming and Colorado with snow and produced destructive tornadoes in Nebraska and Iowa. At least four deaths were attributed to the weather, including a South Dakota man who collapsed while cleaning snow off his roof." Early estimates suggest western South Dakota lost at least 5 percent of its cattle, said Silvia Christen, executive director of the South Dakota Stockgrowers Association. Some individual ranchers reported losses of 20 percent to 50 percent of their livestock, Christen said. The storm killed calves that were due to be sold soon as well as cows that would produce next year’s calves in an area where livestock production is a big part of the economy, she said. Some reports say as many as 10,000/20,000 cattle died from the snow storm. Moose die-off: All across the US, moose are dying in large numbers – and scientists haven't figured out why yet. Climate change may be behind the moose die-off. All across the US, moose are dying – and scientists yet don’t know how to save them. Moose populations across swaths of the US – from the West Coast to the East Coast, from the Rocky Mountains to the Mississippi River – are declining at an unprecedented rate, imperiling fragile ecosystems and putting the moose tourism industry on edge, the New York Times reported. But though scientists have a long list of culprits – disease; climate change; over-hunting – it’s not clear just what is causing moose to die in droves. And that means that scientists are at the moment unsure how to save America's moose. Hundreds of sea turtles are washing up dead on the beaches of Central America and scientists don’t know why. One hypothesis is that the killer is a potent neurotoxin that can be produced by algae during red tides, which are large accumulations of algae that turn sea water red or brown. The puzzling thing, though, is that red tides have come and gone before without taking such a deadly toll on turtles. 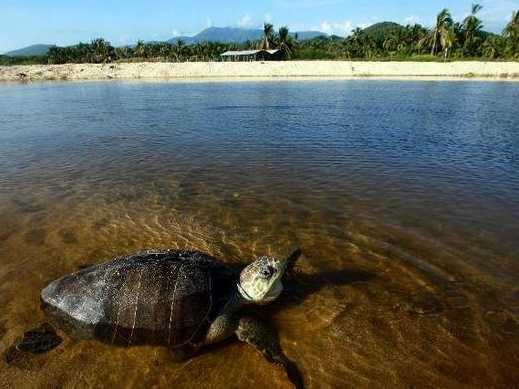 Making things worse, some o f the turtles dying are from endangered species. LINDSAY Dines has been watching dead mutton birds wash in at Teewah for more than a month. He knows death is part of their migratory fate. Their long, figure eight of the Pacific that starts in Tasmania, touches the northern hemisphere Aleutian Islands and then California before the long journey home. But Lindsay fears something more is at play. The avid fisherman and environmentalist has deep concerns about the numbers dying. "I'm told that a month ago a count was done by someone - 25,000 between Noosa North Shore and Caloundra,'' he said. 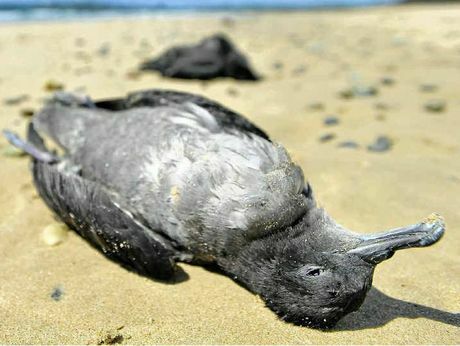 "And there are media reports of dead birds extending from Bundaberg to southern coast of Victoria, plus Tasmania and the New Zealand's west coast - in abnormally large numbers and along all beaches creating great concern in communities all along the coast. Given the range of the death and numbers being reported, Mr Dines fears as many as five million birds may have died. 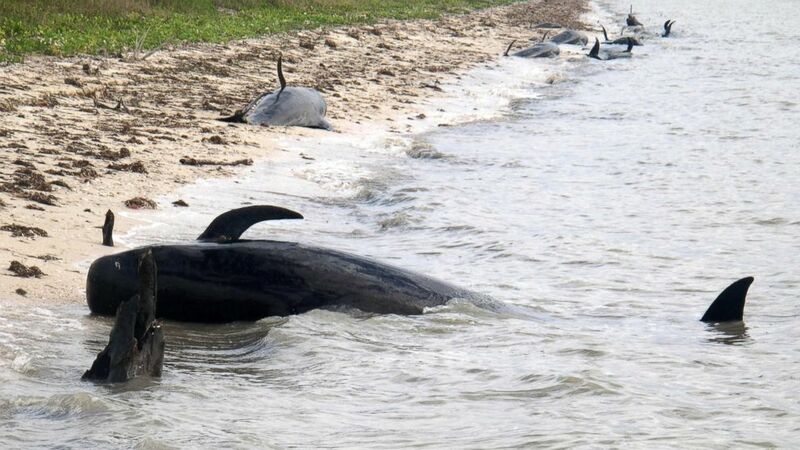 CLIMATE – Ten whales have died and as many as 30 more are stranded after a pod beached off Florida’s Everglades National Park, US government officials have said. The pilot whales were swimming in only 3ft (0.9m) of salt water at a remote beach on Tuesday. Initial rescue efforts have been stymied because the water around the animals is too shallow for boats. Scientists believe the whales may have become stranded during low tide and were unable to return to deeper water. Pods of 35 stranded pilot whales were moving into deeper waters of Florida’s Everglades National Park, raising hopes for their survival, officials said Thursday. Three pods were located nine miles north of their original location on the Gulf of Mexico side of the park and moving offshore, National Oceanic and Atmospheric Administration fisheries official Blair Mase said at a Thursday afternoon teleconference, adding that the animals were in 12 feet of water by midafternoon. Mase said the whales may defy the odds and reach their normal deep-ocean range. By Thursday afternoon, 11 whales had been found dead and five others were unaccounted for, according to Mase. Eleven more pilot whales have been found dead in the lower Florida Keys days after their pod became stranded in shallow waters along the coast, officials said Sunday, calling the outlook "bleak" for 29 surviving whales that remain unaccounted for. A rescue team was en route and scientists were set to arrive Monday to determine a cause of death for the highly social creatures, the National Oceanic and Atmospheric Administration's Fisheries Service said in a Sunday statement. Pilot whales are highly social and prone to mass strandings because they are reluctant to break away from their podmates even when in trouble, experts say. "ON the first of November, when Mexicans celebrate a holiday called the Day of the Dead, some also celebrate the millions of monarch butterflies that, without fail, fly to the mountainous fir forests of central Mexico on that day. They are believed to be souls of the dead, returned. That’s because of another major factor that has not been widely recognized: the precipitous loss of native vegetation across the United States. First the bees now the monarchs. What else??? Round up shall we say GMO plants too? "Disaster management officials say they have removed about 300 dead seals from Kommetjie Beach in Cape Town. A high tide or extreme wind conditions probably caused the animals to be washed off Seal Island on Thursday night and officials say it is not a particularly unusual phenomenon. Hundreds of dead seals are scattered around the peninsula from Strandfontein as far as Kommetjie. Those passing by say the mammals have been laying there for hours. An onlooker who drives past Muizenberg Beach everyday says he spotted the seals on the shore at 7am. 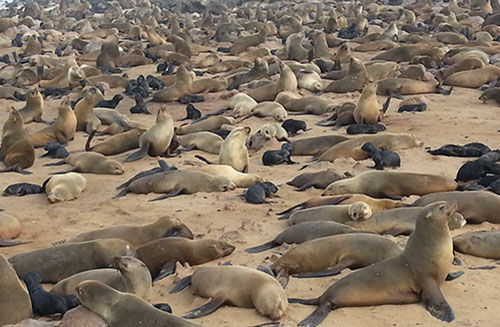 According to disaster management's Johannes Solomons-Johannes, there are more 100 dead seals which must still be removed between Strandfontein and Monwabisi Beach." The oceans are suffering Breezy and the life within it cannot cope with the turmoil of change, which is such a pity because I often think they deserve life more than some of those with two legs still walking around. Wildlife » Farmington family alerts DWR to stricken raptor; necropsy test results due next week. "The Isaacson family frequently spots bald eagles in the skies above their Farmington home, but this week’s eagle sighting was different. "I turned the flashlight and saw this eagle on the ground. I thought he would fly as I got closer but he didn’t," Isaacson said. "He struggled like he was caught on something." Isaacson had heard recent stories of bald eagles dying so he called officials. They asked him to get close enough to see whether the raptor would fly, but it ended up wading through Farmington Creek in their backyard. Wildlife officials later had a hard time finding the bald eagle. It had moved back across the creek and was hiding. "He put up quite a fight," Isaacson said. "He was hissing and striking out." 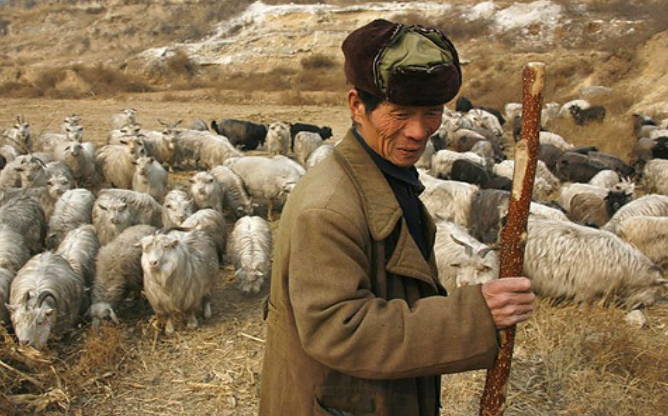 The Ministry of Agriculture on Thursday confirmed that goats in northwest China’s Xinjiang Uygur Autonomous Region have died of a plague called “peste des petits ruminants.” On Dec. 21, a farm reported that 176 goats had showed symptoms of the disease in Hami Prefecture and 34 of them had died. Fall Migration Corridor This map summarizes the southward migration routes of adult bald eagles tagged at Millerton Lake. "KUTV, Dec. 28, 2013: Wildlife experts are on high alert as more bald eagles are found suffering from a mysterious illness [...] It’s a very big concern. Wildlife experts have never seen anything like this before with bald eagles. […] Wildlife experts have never seen bald eagles suffer like this before in Utah and scientists are unsure of what is making them ill.
KSTU, Dec. 15, 2013: Officials thought the symptoms might have been from lead poisoning, but that doesn’t appear to be the case. [...] “I don’t think words can describe what you see and what you feel, and the helplessness and trying to figure out what’s going on,” [DaLyn Erickson, executive director at the Wildlife Rehabilitation Center of Northern Utah] said. Symptoms suffered by the birds include, leg paralysis, wing paralysis, head tremors and seizures." There are multiple separate reports listed on this page. gee wonder if Fukushima has anything to do with what's going on. They are all aware of what's coming, but no one will act cause it will disrupt their plans.